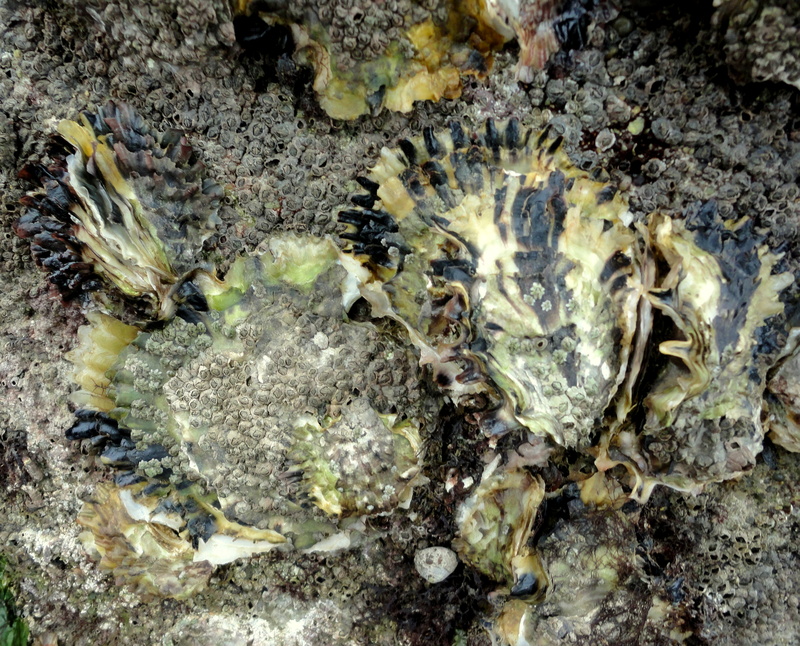 There are oysters clinging to the seawards side, oodles of them and they’re nearly all the native species, now rare at home due to overfishing and the invasion of the Pacific oyster. Not only that, but among them, reaching out like flowers towards the light are pale pink Devonshire cup corals. At home, I see these occasionally at the back of dark wave-battered overhangs, but these are in the open so I can get in close and marvel at every spoke of their delicate wheel-like markings. It’s a magical moment and I long for a camera with a macro strong enough to capture them. Then I’m holding my breath. Amongst these corals are minuscule dots of intense yellow, barely a centimetre across. I crouch in the muddy sand and see that they are corals too, with a deep convex centre surrounded by struts of coralline skeleton and a hint of tentacles. It’s a challenge too far for my camera, but the glow of colour imprints on my eyes as though I am staring at a light. I think I’m seeing scarlet and gold cup corals for the first time. 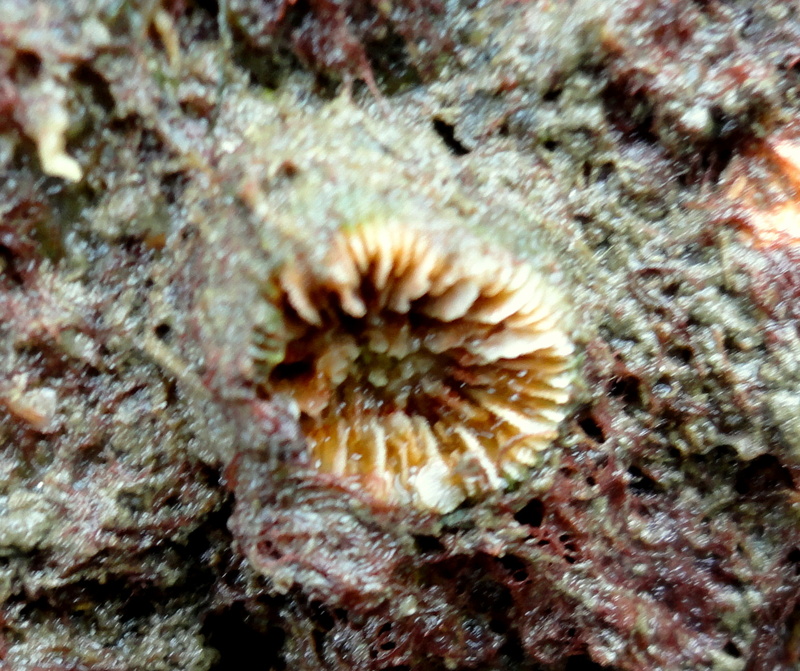 Cup coral – probably the Scarlet and gold species. Ed brings a large shell over, a whelk. I turn it over and almost put it back when I realise that near the opening, under a sheen of sand and mud, something large is growing. I rinse it off and we both stare at a stout anemone with thick rosy brown stripes at its base. Deep inside the shell is a large hermit crab, unmoving, perhaps dead and a juvenile spiny starfish is lurking in the operculum. 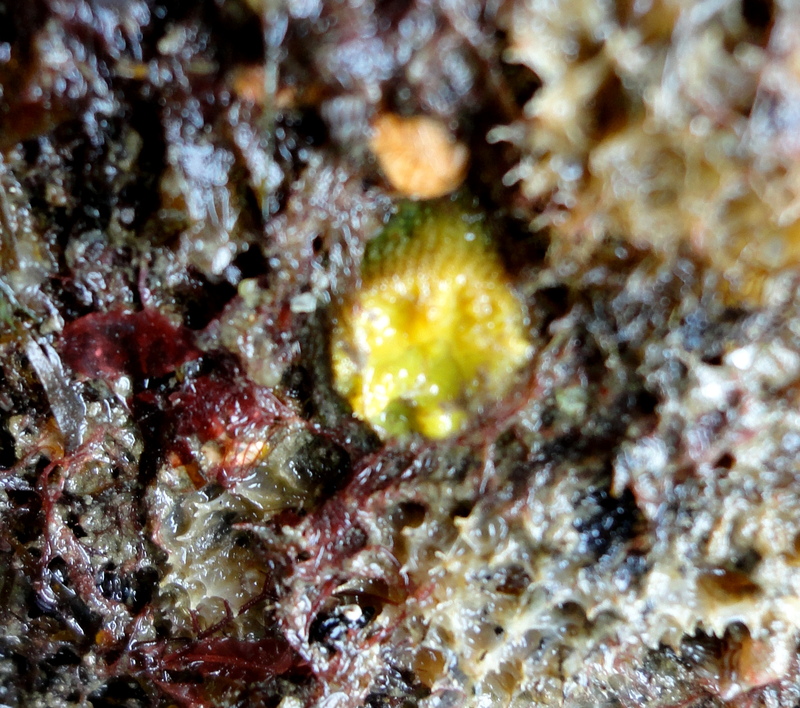 It’s another first for me: a ‘parasitic’ anemone, which is, as far as I know, not a parasite at all but a remarkable creature that lives with the common hermit crab (Pagurus bernhardus) in a relationship benefitting both animals. In return for being carried around and accessing scraps of food, the hermit’s stinging tentacles offer the crab protection from predators. 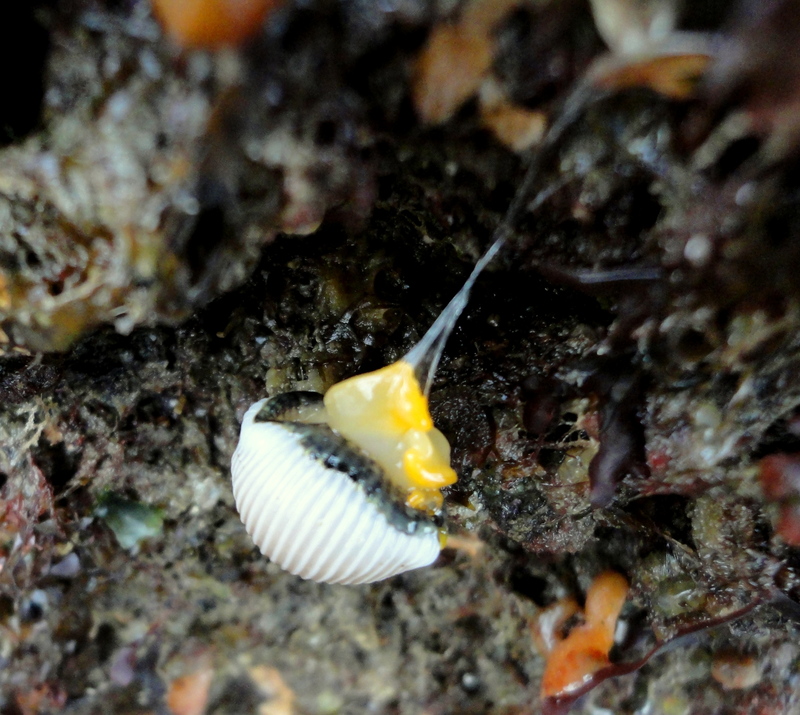 When attacked, the anemone releases white threads called acontia that are packed with stinging cells, as this one does now when I move the shell. 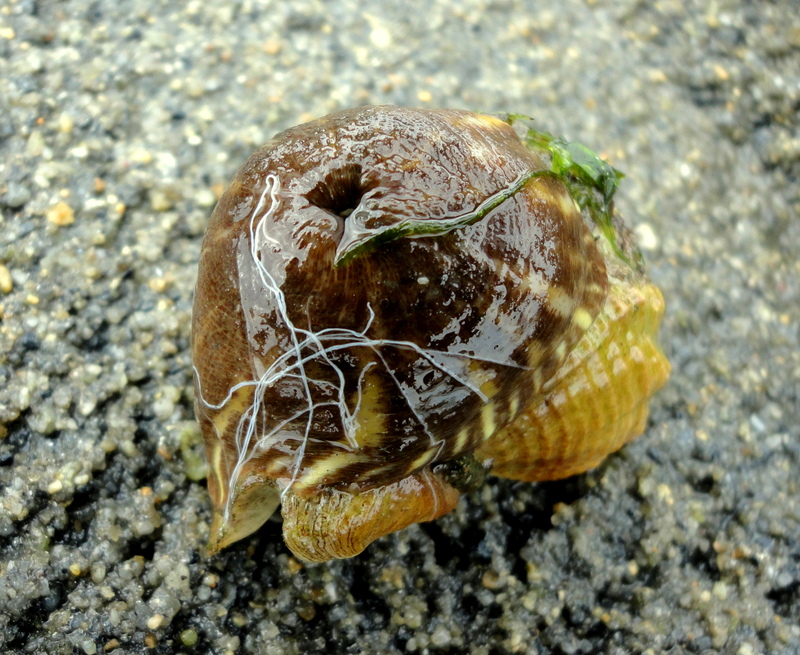 The anemone released protective stinging threads (acontia) when moved. 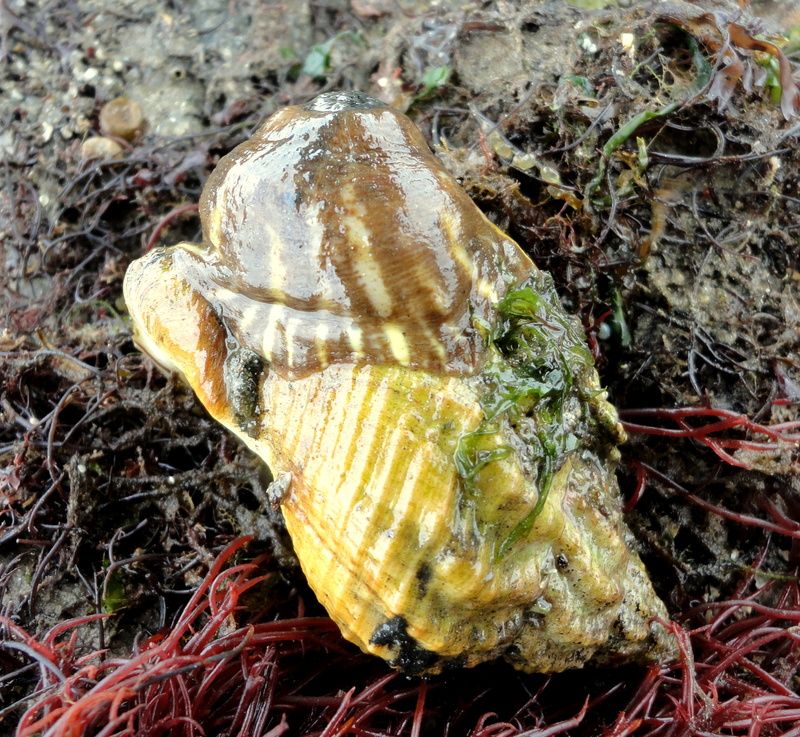 The muddy sand and loose rocks at the harbour edge are packed with more treasures. A young eel slips into a hole as I gently turn a rock. 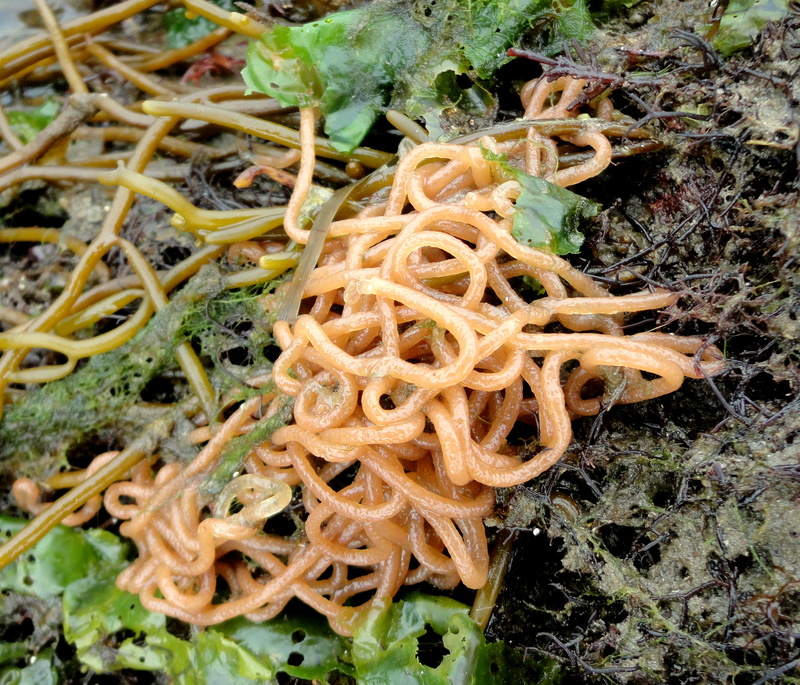 A pink spaghetti of sea hare eggs lies in clumps among the seaweed. It’s unseasonably late to find them but the water is warm and the autumn gales haven’t yet arrived. In clear granite pools lined with coralline algae, snakelocks anemones sway, prawns swim over and tickle the camera. 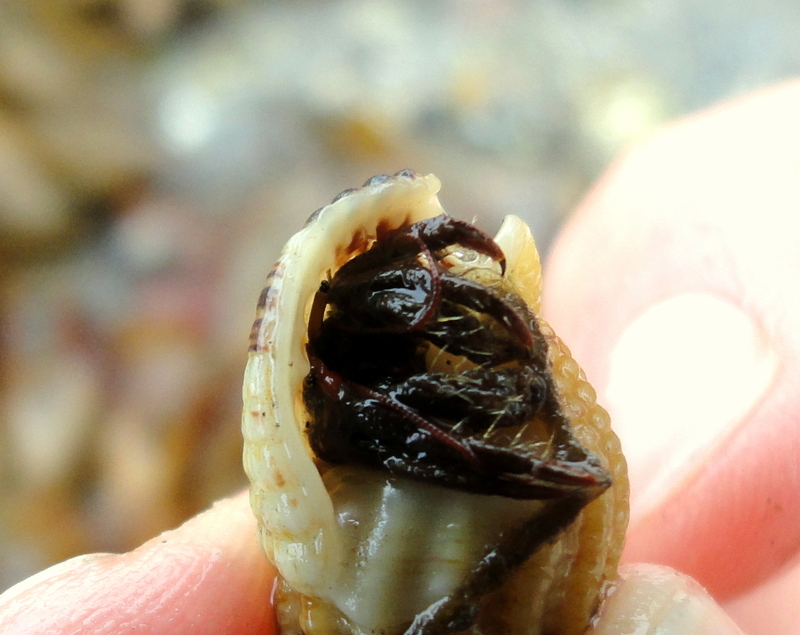 Hairy hermit crabs roam in netted dog-whelk shells, surveying the world through stick-eyes as long as their heads. Trévignon is an active fishing community and there are several families out digging for bait, but the site clearly suffers little disturbance. The harbour wall and the structure of the lifeboat station have created a sheltered haven for sea creatures on an otherwise wild and windswept coast. The fauna is similar to Cornwall, but I’m taken aback at seeing species here that I have spent years looking for at home. I can’t wait for day two.